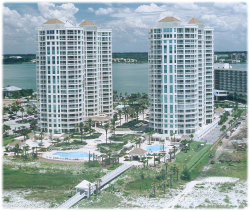 Creating a breezy-but-elegant lifestyle evocative of Florida's historic seaside retreats, and preserving and enhancing the natural environment were among the design goals that helped shape The Grande. And, from the stunning entry, through the 234 homes, to the Old-Florida-style boardwalk, the plan was accomplished with accolades. Its two stately structures barely hint at the sophistication within, and its beauty belies the robust strength and durability of the building itself. The Grande, completed in 1998, was the first JMC community to employ advanced post-tension construction throughout its tower structures.